Dronabinol is used to treat nausea and vomiting caused by cancer chemotherapy. It is usually used when other drugs to control nausea and vomiting have not been successful. Dronabinol is also used to treat loss of appetite and weight loss in patients with HIV infection. Dronabinol (also called THC) is a man-made form of the active natural substance in marijuana. Read the Patient Information Leaflet if available from your pharmacist before you start taking dronabinol and each time you get a refill. If you have any questions, ask your doctor or pharmacist. Take this medication by mouth as directed by your doctor, usually up to 4 to 6 times daily if you are taking it to control nausea and vomiting or twice daily (before lunch and before dinner) if you are taking it to treat appetite loss. Follow your doctor's instructions carefully. What conditions does Marinol treat? Dizziness, drowsiness, confusion, feeling "high", an exaggerated sense of well-being, lightheadedness, nausea, vomiting, or stomach/abdominal pain may occur as your body adjusts to the medication. If any of these effects persist or worsen, tell your doctor or pharmacist promptly. List Marinol side effects by likelihood and severity. Before taking dronabinol, tell your doctor or pharmacist if you are allergic to it; or to marijuana; or if you have any other allergies. This product may contain inactive ingredients (such as sesame oil), which can cause allergic reactions or other problems. Talk to your pharmacist for more details. This drug may make you dizzy or drowsy or affect your judgment. Alcohol or marijuana can worsen these effects. Do not drive, use machinery, or do anything that needs alertness until you can do it safely. Avoid alcoholic beverages. Talk to your doctor if you are using marijuana. What should I know regarding pregnancy, nursing and administering Marinol to children or the elderly? Does Marinol interact with other medications? Keep all medical appointments so your doctor can monitor your response to treatment (such as your weight) and check for side effects. Store this medication according to the directions on the product package, away from light and moisture. Some brands must be refrigerated, and others may be stored at room temperature. Consult your pharmacist for more details. Do not freeze this medication or store it in the bathroom. Keep all medications away from children and pets. 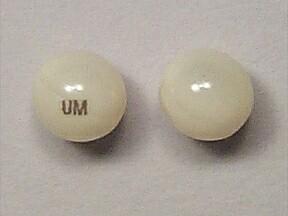 This medicine is a white, round, capsule imprinted with "UM". 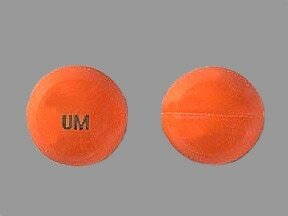 This medicine is a orange, round, capsule imprinted with "UM". 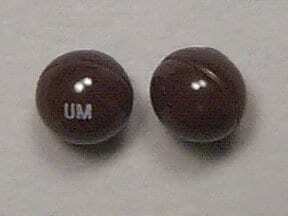 This medicine is a dark brown, round, capsule imprinted with "UM". Are you considering switching to Marinol? How long have you been taking Marinol?